Ross Stores, Inc. is an American company that runs a chain of discount apparel stores under the name Ross Dress for Less®. They are one of the largest off-price department stores in the country with 1,483 locations spanning 37 states. Shoppers looking to find brand-name clothing at a good price visit Ross Stores. They offer a variety of brands with almost 98% of their inventory selling for under $30. Low prices attract thousands of people to visit their stores each year. Retail shops must ensure that their store is safe for its visitors especially when there are a lot of customers in the store. Keeping aisles clear of debris, cleaning up spills or water tracked in from the outside, and ensuring that displays and shelves are properly secured are just a few steps that a store can take to prevent accidents. When they neglect this responsibility, shoppers can get hurt. Whether it’s a minor or severe injury, no one goes to the store expecting to return home hurt. If you’ve been injured in a retail store accident, the personal injury attorneys at the Wolfson Law Firm can help. Find out what your options are by calling 305-285-1115 for a free and confidential consultation. Slips and falls are the most common accidents in retail stores. Customers who slip on a wet floor and fall may end up with bruises, cuts, scrapes, or broken bones. Hitting your head on the hard floor, a clothing rack, or on the corner of a nearby display case can cause serious head, neck, and back injuries. Display cases, racks, or boxes that protrude into the aisles and walkways may cause a customer trip and fall. Extension cords that are used to power displays can be a tripping hazard if they aren’t taped down. Head, neck, and back injuries are common in trip and fall cases. Stores that have elevators and stairwells can also result in trip and fall injuries. Customers can sustain cuts, sprains, broken bones, and injuries to the head, neck, or back if they fall down stairs or trip getting into or out of an elevator. Cuts and scratches – A customer may be cut or scratched if a countertop has broken or jagged edges. Clothing that has pins or labels with staples can cause small puncture wounds. While cuts and scratches are relatively minor, they can turn into a more serious injury if they become infected or if the pins used were dirty. 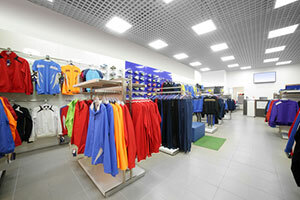 Head injuries – Retail displays that extend from the floor to the ceiling may not be adequately secured to the wall. Falling shelves, parts, or merchandise can hit customers on the head if they become dislodged. Overhead lighting fixtures, displays, and signs may also come crashing down if they aren’t secured properly. Customers may be hit on the head, which can result in serious trauma to the brain. Neck and back injuries – Neck and back injuries are common in slip and fall accidents. They can also happen when large crowds are in the store. Whether it’s Black Friday or just a really good sale, people can get pushed, knocked over, or stepped on if a large crowd in pushing to get up to the doors. In addition to neck and back injuries, this can also result in head injuries, broken bones, cuts, and lacerations. Foot or hand injures – Escalators can result in injuries to hands or feet. Falling down or getting fingers caught in open gaps are some of the most common causes of injury on an escalator. For over 55 years, the Wolfson Law Firm has defended accident victims who have been injured in retail stores. With offices located in Miami, Fort Lauderdale, Fort Myers, and West Palm Beach, we serve clients throughout South Florida. If you have been injured at a retail store and wonder if you have a case, call the retail injury accident attorneys at the Wolfson Law Firm at 305-285-1115 for a free consultation.